The Painted Turtle is the most common turtle in the region. In parts of Minnesota and Wisconsin they are commonly called "mud turtles". 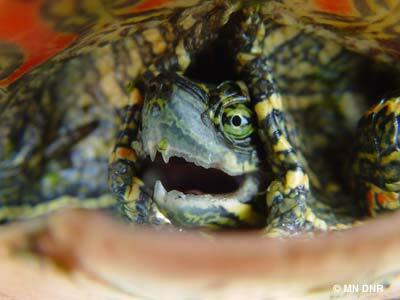 General description: The Painted Turtle carapace ranges from black to dark olive green. The carapace is smooth and shiny. The plastron varies from red to orange with differing amounts of black patterning. 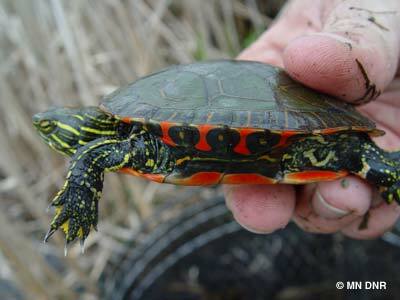 The legs and head of the painted turtle are black with yellow stripes. The appearance is similar to wide pinstripes. Painted Turtles are medium-sized oval turtles. The females grow to 10 inches in length while the males only grow to 7 inches long.